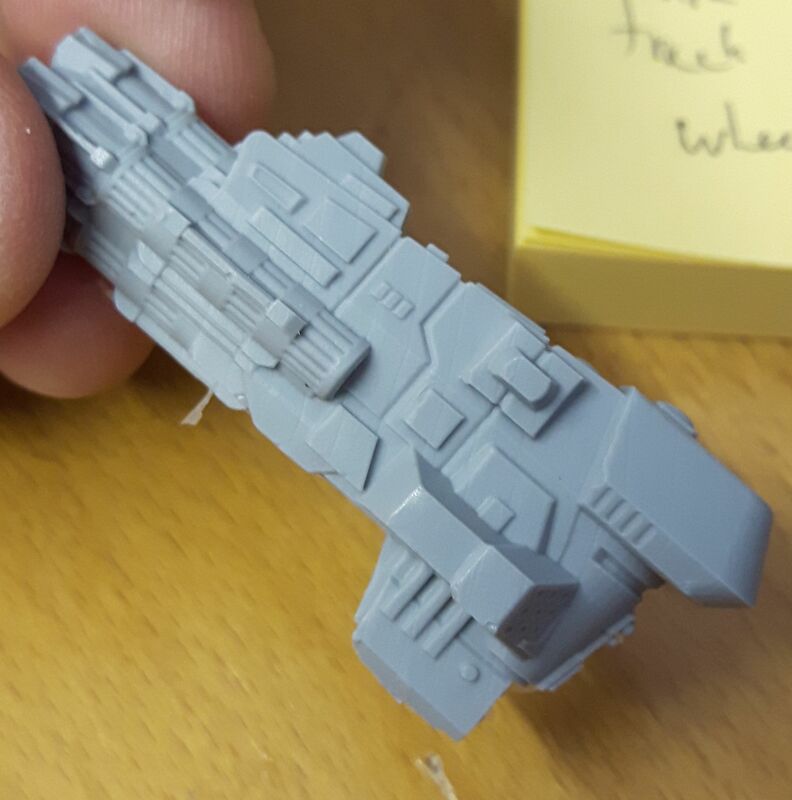 Casting hundred of pieces this week for the Jovian Wars Kickstarter resin models I was reflecting on how some models started off as a clear design archetypes and yet became even better as the player suggestions really ramped up. For anyone not in the know, DP9 had a kickstarter for our new game, Jovian Wars, and it was awesome. 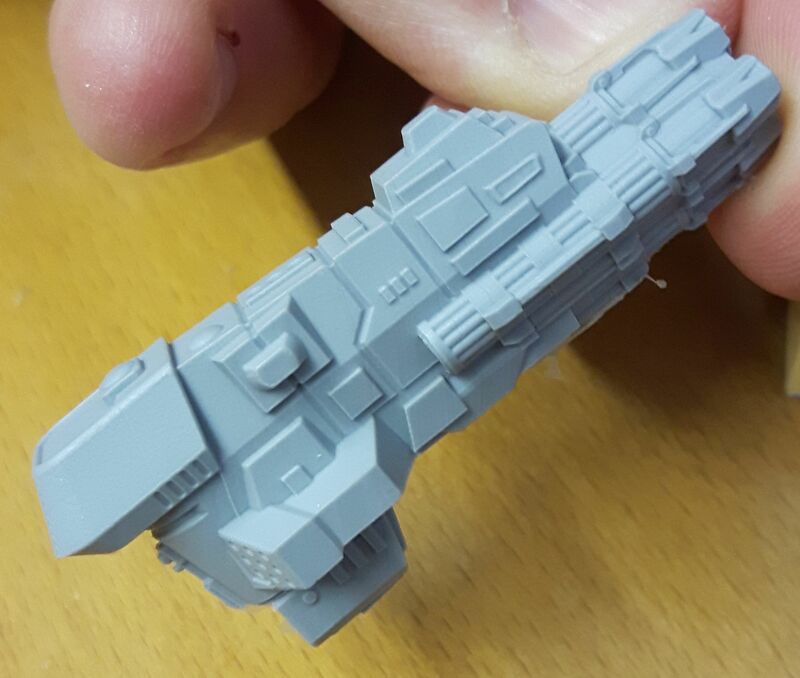 143 great backers raised over $25000 to unlock a whole new generation of ship models and remaster all the older Jovian Chronicles ship models in resin. Add in new bases for better stability and to make measuring, firing arcs, and turning easier and we have an exciting new game. The rules as well have received a lot of attention. Today I'm going to look at one of the remastered models for the CEGA faction, the Uller. The Uller is a short little scow of a ship. It looks like what it does, and what it does is pack a huge missile payload into a short ship, and then stands back and unleashes them. At 36 Threat value it's a very economical gun boat. It suffers from the target being able to use point defense and support to shoot down the missiles before they can hit their target. Missiles have a number of significant benefits that relate to how the rules evolved. Early on in development the ship speeds and ranges had been determined in rough parameters. The range difference for short range targeting (6" vs capital ships, 3" vs squadrons) was set and in initial game play the Uller did what it was supposed to do, until it got killed. This usually happened fairly fast since it's a bulky ship and does not benefit from the evasive trait of smaller and more agile ships like the Briciu but also does not have the sheer structure rating of larger ships that let it survive to use it's missiles once good targets had had their point defense reduced by other fire. 8.9 Long Range Sensors: Capital ship only. Requires Capital ship target. Requires Sensors 1+: This model may double its sensor range this activation. All attacks must target the same capital ship or terrain model. Do not add flank or rear modifiers to the attack roll. Diminish the results of the attacks. This increase in range is perfect for the Uller as it can now easily sit back and launch missiles from a position of safety. An Ullers' main advantages for this role stem from its sensor systems which have two redundancies (#1 in the data card image above). This gives it an effective threat range of 30". (6" for basic anti-capital ship short range plus 9" of long range sensors for 15" total, doubled with the Long Range Sensors special action for 30"!) This is a very long range and perfect for keeping the Uller a long way from potential boarding actions. 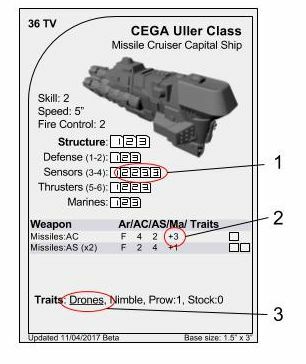 [Drones] Drones (System): A model with a drones trait gains a flex dice [+/-1D6] when making repair rolls, attacking with a missile weapon, and defending using Point Defense. This means that when firing the Anti-Capital ship missiles with the long range sensors you will roll 4D6+/-1D6. (#3 in the data card image above). This is 20% odds for getting a [T+] result which is important considering that other ships attacking with 4D6 only get 16% and with 3D6 only 3% of attacks will cause hits at long range since flank and rear benefits don't help. This level of firepower equals the accuracy of the biggest ships in the CEGA fleet, the Hammerhead and the Poseidon, while exceeding them in firepower. When a hit from an Uller Anti-Capital ship hits a target the massive +3D6 Macro dice come into play (#2 in the data card image above). http://dp9forum.com/index.php?/topic/18071-beta-rules-v12-errata-and-faq/Macro used to be a trait which has now been added as a basic attribute of a weapon (to be added to the next update, and now in the errata). Macro is also covered in 1.1 Dice rolling. Getting a [D] result and then getting to roll 3D6 extra dice to improve the result or cause more damage is a good way to cause catastrophic damage to a target. The only way the Uller could get better would be if you could upgrade it's missile batteries to fire more big missiles... Oh wait, you can. 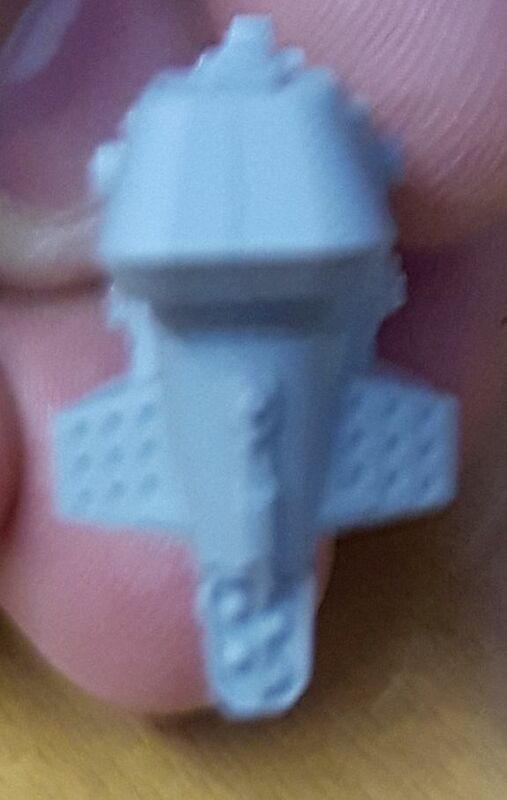 The new model has nice hard points on it's dorsal side and both flanks. If you want to take advantage of the drones trait then adding a pair of AC:3/AS:1/Ma:+1 missile weapons with the Link trait will only cost +11TV. Linking the weapons allows them to fire using only one Fire Control, important for a ship with only two. Adding the Macro rating to +2 would only cost a further +4TV for the pair of weapons or for +5TV a third extra launcher would be quite frightening. Top view, love the detail! 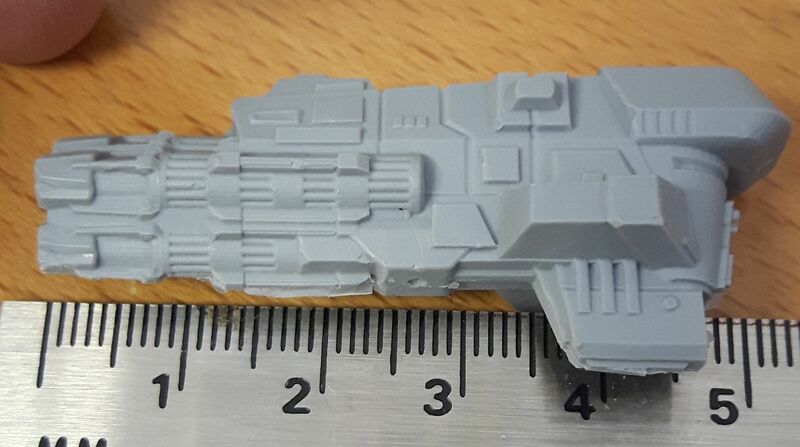 And another side view with a ruler for scale. Enjoy your vacations! I'm an off to the East Coast of Canada until mid-July then back packing up backer rewards.